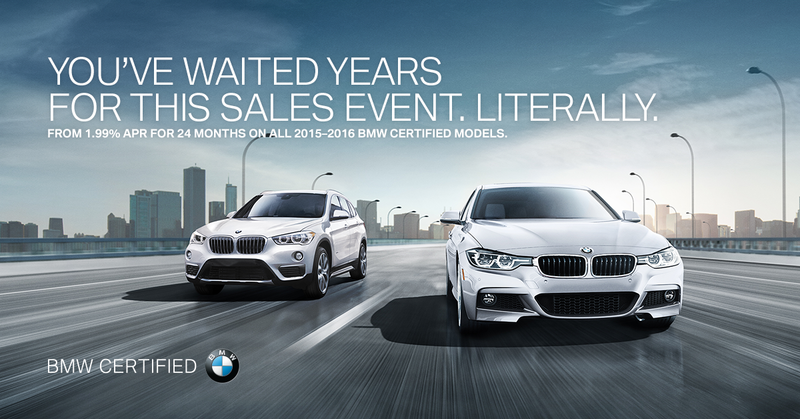 1.99% APR for 24 months on all 2015-2016 BMW certified models. BMW Certified, ONLY 48,877 Miles! Moonroof, Heated Seats, Rear Air, Turbo Charged Engine, Dual Zone A/C, CD Player, iPod/MP3 Input, ANTHRACITE WOOD TRIM, HEATED FRONT SEATS, TRANSMISSION: 8-SPEED AUTOMATIC W/STE... Aluminum Wheels, PREMIUM PACKAGE, DRIVER ASSISTANCE PACKAGE. KEY FEATURES INCLUDE Rear Air, Turbocharged, iPod/MP3 Input, CD Player, Dual Zone A/C. MP3 Player, Onboard Communications System, Aluminum Wheels, Child Safety Locks, Steering Wheel Controls. OPTION PACKAGES PREMIUM PACKAGE Storage Package, Auto-Dimming Rearview Mirror, Universal Garage-Door Opener, Auto-Dimming Interior & Exterior Mirrors, Moonroof, Power Front Seats w/Driver Seat Memory, Satellite Radio, Comfort Access Keyless Entry, Lumbar Support, DRIVER ASSISTANCE PACKAGE Rear View Camera, Park Distance Control, ANTHRACITE WOOD TRIM Chrome Trim Highlight, HEATED FRONT SEATS, TRANSMISSION: 8-SPEED AUTOMATIC W/STEPTRONIC (STD). Unlimited Miles for 1-Year plus the balance of original new vehicle warranty (4-Year/50,000-Miles), 24-Hour BMW Roadside Assistance , Comprehensive Inspection and Reconditioning WHY BUY FROM US Welcome to Reeves Import Motorcars, a family owned and operated business since 1971. On behalf of our staff, thank you for visiting us on the Web and giving us an opportunity to acquaint you with our dealership. Our commitment to perfection is exceeded only by our resolve to offer you the highest levels of guest services in the luxury automotive industry. Our professional and well trained staff is ready to assist you with your new or pre-owned automotive needs. While every reasonable effort is made to ensure the accuracy of this information, we are not responsible for any errors or omissions contained on these pages. All offers are mutually exclusive. All vehicles subject to prior sale. Please verify any informa Horsepower calculations based on trim engine configuration. Please confirm the accuracy of the included equipment by calling us prior to purchase. BMW Certified, LOW MILES - 14,632! Heated Seats, CD Player, iPod/MP3 Input, Dual Zone A/C, Keyless Start, Rear Air, HEATED FRONT SEATS, TRANSMISSION: 8-SPEED AUTOMATIC W/STE... BURL WALNUT WOOD TRIM, Turbo Charged Engine, Aluminum Wheels. KEY FEATURES INCLUDE Rear Air, Turbocharged, iPod/MP3 Input, CD Player, Keyless Start, Dual Zone A/C. MP3 Player, Onboard Communications System, Aluminum Wheels, Keyless Entry, Child Safety Locks. OPTION PACKAGES BURL WALNUT WOOD TRIM Pearl Gloss chrome highlight, HEATED FRONT SEATS, TRANSMISSION: 8-SPEED AUTOMATIC W/STEPTRONIC (STD). BMW 320i with Alpine White exterior and Black SensaTec interior features a 4 Cylinder Engine with 180 HP at 5000 RPM*. BUY WITH CONFIDENCE Unlimited Miles for 1-Year plus the balance of original new vehicle warranty (4-Year/50,000-Miles), 24-Hour BMW Roadside Assistance, Comprehensive Inspection and Reconditioning, Trip-Interruption Services, Trip-Planning Services EXCELLENT SAFETY FOR YOUR FAMILY Child Safety Locks, Electronic Stability Control, Brake Assist, 4-Wheel ABS, 4-Wheel Disc Brakes MORE ABOUT US Welcome to Reeves Import Motorcars, a family owned and operated business since 1971. On behalf of our staff, thank you for visiting us on the Web and giving us an opportunity to acquaint you with our dealership. Our commitment to perfection is exceeded only by our resolve to offer you the highest levels of guest services in the luxury automotive industry. Our professional and well trained staff is ready to assist you with your new or pre-owned automotive needs. While every reasonable effort is made to ensure the accuracy of this information, we are not responsible for any errors or omissions contained on these pages. All offers are mutually exclusive. All vehicles subject to prior sale. Please verify any informa Horsepower calculations based on trim engine configuration. Please confirm the accuracy of the included equipment by calling us prior to purchase. BMW Certified, ONLY 42,288 Miles! Navigation, Heated Seats, Moonroof, Turbo Charged, CD Player, Dual Zone A/C, iPod/MP3 Input, Rear Air, DARK BURL WALNUT WOOD TRIM, COLD WEATHER PACKAGE, TRANSMISSION: 8-SPEED STEPTRONIC AUTO... POWER FRONT SEATS W/DRIVER SEAT MEMOR... SPORT LINE, TECHNOLOGY PACKAGE, DRIVER ASSISTANCE PACKAGE, PREMIUM PACKAGE. KEY FEATURES INCLUDE Rear Air, Turbocharged, iPod/MP3 Input, CD Player, Dual Zone A/C Onboard Communications System, Steering Wheel Controls, Child Safety Locks, Heated Mirrors, Electronic Stability Control. OPTION PACKAGES TECHNOLOGY PACKAGE Head-Up Display, Navigation System w/Touchpad, Remote Services, Advanced Real-Time Traffic Information, BMW Online & BMW Apps, Instrument Cluster w/Extended Contents, PREMIUM PACKAGE Moonroof, Satellite Radio, Comfort Access Keyless Entry, Lumbar Support, SPORT LINE black high-gloss design elements (bumper and air intake trim, kidney bars, exhaust pipes, B-pillar and mirror caps), chrome rings around A/C and radio controls, sport instrument cluster and signature key, Sport Line Aesthetic Elements BUY FROM AN AWARD WINNING DEALER Welcome to Reeves Import Motorcars, a family owned and operated business since 1971. On behalf of our staff, thank you for visiting us on the Web and giving us an opportunity to acquaint you with our dealership. Our commitment to perfection is exceeded only by our resolve to offer you the highest levels of guest services in the luxury automotive industry. Our professional and well trained staff is ready to assist you with your new or pre-owned automotive needs. While every reasonable effort is made to ensure the accuracy of this information, we are not responsible for any errors or omissions contained on these pages. All offers are mutually exclusive. All vehicles subject to prior sale. Please verify any informa Horsepower calculations based on trim engine configuration. Please confirm the accuracy of the included equipment by calling us prior to purchase. BMW Certified, LOW MILES - 25,079! Nav System, Heated Seats, Keyless Start, Smart Device Integration, iPod/MP3 Input, WHEELS: 20 X 5.0 FRONT/20 X 5.5 R... WHEELS: 20 X 5.0 FRONT/20 X 5.5 RR DBLE SPOKE, Satellite Radio. KEY FEATURES INCLUDE Navigation, Heated Driver Seat, Satellite Radio, iPod/MP3 Input, Keyless Start, Smart Device Integration, Heated Seats Rear Spoiler, MP3 Player, Onboard Communications System, Remote Trunk Release, Keyless Entry. OPTION PACKAGES WHEELS: 20 X 5.0 FRONT/20 X 5.5 RR DBLE SPOKE Sport BMW i light alloy, Style 430, Tires: P155/60R20 Front & P175/55R20 Rear Mixed tires. BMW i3 with Mineral Grey w/ BMW i Blue exterior and Mega (Sensatec and Cloth) interior features a Electric Motor with 170 HP at 4800 RPM*. PURCHASE WITH CONFIDENCE Unlimited Miles for 1-Year plus the balance of original new vehicle warranty (4-Year/50,000-Miles), 24-Hour BMW Roadside Assistance, Comprehensive Inspection and Reconditioning, Trip-Interruption Services, Trip-Planning Services EXCELLENT SAFETY FOR YOUR FAMILY Electronic Stability Control, Brake Assist VISIT US TODAY Welcome to Reeves Import Motorcars, a family owned and operated business since 1971. On behalf of our staff, thank you for visiting us on the Web and giving us an opportunity to acquaint you with our dealership. Our commitment to perfection is exceeded only by our resolve to offer you the highest levels of guest services in the luxury automotive industry. Our professional and well trained staff is ready to assist you with your new or pre-owned automotive needs. While every reasonable effort is made to ensure the accuracy of this information, we are not responsible for any errors or omissions contained on these pages. All offers are mutually exclusive. All vehicles subject to prior sale. Please verify any informa Horsepower calculations based on trim engine configuration. Please confirm the accuracy of the included equipment by calling us prior to purchase. BMW Certified. Navigation, Moonroof, Heated Seats, Rear Air, Dual Zone A/C, CD Player, iPod/MP3 Input, Turbo Charged, DRIVER ASSISTANCE PACKAGE, HEATED FRONT SEATS, PREMIUM PACKAGE, Aluminum Wheels, TECHNOLOGY PACKAGE. KEY FEATURES INCLUDE Rear Air, Turbocharged, iPod/MP3 Input, CD Player, Dual Zone A/C Onboard Communications System, Aluminum Wheels, Steering Wheel Controls, Child Safety Locks, Electronic Stability Control. OPTION PACKAGES TECHNOLOGY PACKAGE Head-Up Display, Navigation System, Remote Services, Advanced Real-Time Traffic Information, BMW Online & BMW Apps, Instrument Cluster w/Extended Contents, PREMIUM PACKAGE LED Headlights, Moonroof, Satellite Radio, Comfort Access Keyless Entry, Lumbar Support, DRIVER ASSISTANCE PACKAGE Rear View Camera, Park Distance Control, HEATED FRONT SEATS. BUY WITH CONFIDENCE Unlimited Miles for 1-Year plus the balance of original new vehicle warranty (4-Year/50,000-Miles), 24-Hour BMW Roadside Assistance, Comprehensive Inspection and Reconditioning, Trip-Interruption Services, Trip-Planning Services BUY FROM AN AWARD WINNING DEALER Welcome to Reeves Import Motorcars, a family owned and operated business since 1971. On behalf of our staff, thank you for visiting us on the Web and giving us an opportunity to acquaint you with our dealership. Our commitment to perfection is exceeded only by our resolve to offer you the highest levels of guest services in the luxury automotive industry. Our professional and well trained staff is ready to assist you with your new or pre-owned automotive needs. While every reasonable effort is made to ensure the accuracy of this information, we are not responsible for any errors or omissions contained on these pages. All offers are mutually exclusive. All vehicles subject to prior sale. Please verify any informa Horsepower calculations based on trim engine configuration. Please confirm the accuracy of the included equipment by calling us prior to purchase. BMW Certified, ONLY 31,261 Miles! CD Player, iPod/MP3 Input, Dual Zone A/C, Keyless Start, Alloy Wheels, DRIVER ASSISTANCE PACKAGE, Rear Air, Turbo. KEY FEATURES INCLUDE Rear Air, Turbocharged, iPod/MP3 Input, CD Player, Keyless Start, Dual Zone A/C MP3 Player, Onboard Communications System, Aluminum Wheels, Keyless Entry, Steering Wheel Controls. OPTION PACKAGES DRIVER ASSISTANCE PACKAGE Rear View Camera, Park Distance Control. BMW 328i with Mineral White Metallic exterior and Coral Red Dakota Leather interior features a 4 Cylinder Engine with 240 HP at 5000 RPM*. BUY WITH CONFIDENCE Unlimited Miles for 1-Year plus the balance of original new vehicle warranty (4-Year/50,000-Miles), 24-Hour BMW Roadside Assistance, Comprehensive Inspection and Reconditioning, Trip-Interruption Services, Trip-Planning Services EXCELLENT SAFETY FOR YOUR FAMILY Child Safety Locks, Electronic Stability Control, Brake Assist, 4-Wheel ABS, Tire Pressure Monitoring System, 4-Wheel Disc Brakes VISIT US TODAY Welcome to Reeves Import Motorcars, a family owned and operated business since 1971. On behalf of our staff, thank you for visiting us on the Web and giving us an opportunity to acquaint you with our dealership. Our commitment to perfection is exceeded only by our resolve to offer you the highest levels of guest services in the luxury automotive industry. Our professional and well trained staff is ready to assist you with your new or pre-owned automotive needs. While every reasonable effort is made to ensure the accuracy of this information, we are not responsible for any errors or omissions contained on these pages. All offers are mutually exclusive. All vehicles subject to prior sale. Please verify any informa Horsepower calculations based on trim engine configuration. Please confirm the accuracy of the included equipment by calling us prior to purchase. BMW Certified, GREAT MILES 39,667! Navigation, Moonroof, Heated Seats, Rear Air, Dual Zone A/C, CD Player, iPod/MP3 Input, Turbo Charged, DRIVER ASSISTANCE PACKAGE, HEATED FRONT SEATS, PREMIUM PACKAGE, Aluminum Wheels, TECHNOLOGY PACKAGE. KEY FEATURES INCLUDE Rear Air, Turbocharged, iPod/MP3 Input, CD Player, Dual Zone A/C Onboard Communications System, Aluminum Wheels, Steering Wheel Controls, Child Safety Locks, Electronic Stability Control. OPTION PACKAGES TECHNOLOGY PACKAGE Head-Up Display, Navigation System, Remote Services, Advanced Real-Time Traffic Information, BMW Online & BMW Apps, Instrument Cluster w/Extended Contents, PREMIUM PACKAGE LED Headlights, Moonroof, Satellite Radio, Comfort Access Keyless Entry, Lumbar Support, DRIVER ASSISTANCE PACKAGE Rear View Camera, Park Distance Control, HEATED FRONT SEATS. BUY WITH CONFIDENCE Unlimited Miles for 1-Year plus the balance of original new vehicle warranty (4-Year/50,000-Miles), 24-Hour BMW Roadside Assistance, Comprehensive Inspection and Reconditioning, Trip-Interruption Services, Trip-Planning Services OUR OFFERINGS Welcome to Reeves Import Motorcars, a family owned and operated business since 1971. On behalf of our staff, thank you for visiting us on the Web and giving us an opportunity to acquaint you with our dealership. Our commitment to perfection is exceeded only by our resolve to offer you the highest levels of guest services in the luxury automotive industry. Our professional and well trained staff is ready to assist you with your new or pre-owned automotive needs. While every reasonable effort is made to ensure the accuracy of this information, we are not responsible for any errors or omissions contained on these pages. All offers are mutually exclusive. All vehicles subject to prior sale. Please verify any informa Horsepower calculations based on trim engine configuration. Please confirm the accuracy of the included equipment by calling us prior to purchase. BMW Certified, ONLY 39,532 Miles! Nav System, Moonroof, Heated Seats, CD Player, Rear Air, Dual Zone A/C, iPod/MP3 Input, Turbo Charged Engine, HEATED FRONT SEATS, WHEELS: 18 X 8.0 DOUBLE-SPOKE (STYLE.. DRIVER ASSISTANCE PACKAGE, TECHNOLOGY PACKAGE, PREMIUM PACKAGE. KEY FEATURES INCLUDE Rear Air, Turbocharged, iPod/MP3 Input, CD Player, Dual Zone A/C. Onboard Communications System, Child Safety Locks, Steering Wheel Controls, Electronic Stability Control, Heated Mirrors. OPTION PACKAGES TECHNOLOGY PACKAGE Head-Up Display, Navigation System, Remote Services, Advanced Real-Time Traffic Information, BMW Online & BMW Apps, Instrument Cluster w/Extended Contents, PREMIUM PACKAGE LED Headlights, Moonroof, Satellite Radio, Comfort Access Keyless Entry, Lumbar Support, DRIVER ASSISTANCE PACKAGE Rear View Camera, Park Distance Control, WHEELS: 18 X 8.0 DOUBLE-SPOKE (STYLE 397) Light alloy, Tires: P225/45R18 All Season, HEATED FRONT SEATS. PURCHASE WITH CONFIDENCE Unlimited Miles for 1-Year plus the balance of original new vehicle warranty (4-Year/50,000-Miles), 24-Hour BMW Roadside Assistance WHY BUY FROM US Welcome to Reeves Import Motorcars, a family owned and operated business since 1971. On behalf of our staff, thank you for visiting us on the Web and giving us an opportunity to acquaint you with our dealership. Our commitment to perfection is exceeded only by our resolve to offer you the highest levels of guest services in the luxury automotive industry. Our professional and well trained staff is ready to assist you with your new or pre-owned automotive needs. While every reasonable effort is made to ensure the accuracy of this information, we are not responsible for any errors or omissions contained on these pages. All offers are mutually exclusive. All vehicles subject to prior sale. Please verify any informa Horsepower calculations based on trim engine configuration. Please confirm the accuracy of the included equipment by calling us prior to purchase. BMW Certified, ONLY 36,563 Miles! Sunroof, Rear Air, iPod/MP3 Input, Dual Zone A/C, CD Player, PREMIUM PACKAGE, DRIVER ASSISTANCE PACKAGE, Turbo, Alloy Wheels. KEY FEATURES INCLUDE Rear Air, Turbocharged, iPod/MP3 Input, CD Player, Dual Zone A/C MP3 Player, Onboard Communications System, Aluminum Wheels, Child Safety Locks, Steering Wheel Controls. OPTION PACKAGES PREMIUM PACKAGE LED Headlights, Moonroof, Satellite Radio, Comfort Access Keyless Entry, Lumbar Support, DRIVER ASSISTANCE PACKAGE Rear View Camera, Park Distance Control. BMW 328i with Jet Black exterior and Saddle Brown Dakota Leather interior features a 4 Cylinder Engine with 240 HP at 5000 RPM*. PURCHASE WITH CONFIDENCE Unlimited Miles for 1-Year plus the balance of original new vehicle warranty (4-Year/50,000-Miles), 24-Hour BMW Roadside Assistance, Comprehensive Inspection and Reconditioning, Trip-Interruption Services, Trip-Planning Services EXCELLENT SAFETY FOR YOUR FAMILY Electronic Stability Control, Brake Assist, 4-Wheel ABS, Tire Pressure Monitoring System, 4-Wheel Disc Brakes OUR OFFERINGS Welcome to Reeves Import Motorcars, a family owned and operated business since 1971. On behalf of our staff, thank you for visiting us on the Web and giving us an opportunity to acquaint you with our dealership. Our commitment to perfection is exceeded only by our resolve to offer you the highest levels of guest services in the luxury automotive industry. Our professional and well trained staff is ready to assist you with your new or pre-owned automotive needs. While every reasonable effort is made to ensure the accuracy of this information, we are not responsible for any errors or omissions contained on these pages. All offers are mutually exclusive. All vehicles subject to prior sale. Please verify any informa Horsepower calculations based on trim engine configuration. Please confirm the accuracy of the included equipment by calling us prior to purchase. BMW Certified, LOW MILES - 13,651! Moonroof, Heated Seats, Nav System, Turbo Charged Engine, CD Player, Dual Zone A/C, iPod/MP3 Input, Rear Air, HEATED FRONT SEATS, SPORT SEATS, WHEELS: 18 X 8.0 FR & 18 X 8.5 RR (ST... PREMIUM PACKAGE, DRIVER ASSISTANCE PACKAGE, NAVIGATION SYSTEM. KEY FEATURES INCLUDE Rear Air, Turbocharged, iPod/MP3 Input, CD Player, Dual Zone A/C. Onboard Communications System, Steering Wheel Controls, Child Safety Locks, Electronic Stability Control, Heated Mirrors. OPTION PACKAGES PREMIUM PACKAGE LED Headlights, Moonroof, Satellite Radio, Comfort Access Keyless Entry, Lumbar Support, NAVIGATION SYSTEM Remote Services, Advanced Real-Time Traffic Information, BMW Online & BMW Apps, Instrument Cluster w/Extended Contents, DRIVER ASSISTANCE PACKAGE Rear View Camera, Park Distance Control, WHEELS: 18 X 8.0 FR & 18 X 8.5 RR (STYLE 397) Light alloy double-spoke, Tires: P225/45R18 Fr & P255/40R18 Rr Mixed Perf, HEATED FRONT SEATS, SPORT SEATS (STD). Unlimited Miles for 1-Year plus the balance of original new vehicle warranty (4-Year/50,000-Miles), 24-Hour BMW Roadside Assistance WHY BUY FROM US Welcome to Reeves Import Motorcars, a family owned and operated business since 1971. On behalf of our staff, thank you for visiting us on the Web and giving us an opportunity to acquaint you with our dealership. Our commitment to perfection is exceeded only by our resolve to offer you the highest levels of guest services in the luxury automotive industry. Our professional and well trained staff is ready to assist you with your new or pre-owned automotive needs. While every reasonable effort is made to ensure the accuracy of this information, we are not responsible for any errors or omissions contained on these pages. All offers are mutually exclusive. All vehicles subject to prior sale. Please verify any informa Horsepower calculations based on trim engine configuration. Please confirm the accuracy of the included equipment by calling us prior to purchase. BMW Certified, GREAT MILES 23,618! NAV, Sunroof, Dual Zone A/C, CD Player, Turbo, iPod/MP3 Input, Rear Air, Alloy Wheels, NAVIGATION SYSTEM, SPORT SEATS, DRIVER ASSISTANCE PACKAGE, PREMIUM PACKAGE, DRIVER ASSISTANCE PLUS. KEY FEATURES INCLUDE Rear Air, Turbocharged, iPod/MP3 Input, CD Player, Dual Zone A/C. Onboard Communications System, Aluminum Wheels, Steering Wheel Controls, Child Safety Locks, Electronic Stability Control. OPTION PACKAGES PREMIUM PACKAGE LED Headlights, Moonroof, Satellite Radio, Comfort Access Keyless Entry, Lumbar Support, NAVIGATION SYSTEM Remote Services, Advanced Real-Time Traffic Information, BMW Online & BMW Apps, Instrument Cluster w/Extended Contents, DRIVER ASSISTANCE PLUS Speed Limit Information, Active Driving Assistant, lane departure warning, forward collision warning, pedestrian warning and city collision mitigation, Active Blind Spot Detection, Side & Top View Cameras, DRIVER ASSISTANCE PACKAGE Rear View Camera, Park Distance Control, SPORT SEATS (STD). Unlimited Miles for 1-Year plus the balance of original new vehicle warranty (4-Year/50,000-Miles) OUR OFFERINGS Welcome to Reeves Import Motorcars, a family owned and operated business since 1971. On behalf of our staff, thank you for visiting us on the Web and giving us an opportunity to acquaint you with our dealership. Our commitment to perfection is exceeded only by our resolve to offer you the highest levels of guest services in the luxury automotive industry. Our professional and well trained staff is ready to assist you with your new or pre-owned automotive needs. While every reasonable effort is made to ensure the accuracy of this information, we are not responsible for any errors or omissions contained on these pages. All offers are mutually exclusive. All vehicles subject to prior sale. Please verify any informa Horsepower calculations based on trim engine configuration. Please confirm the accuracy of the included equipment by calling us prior to purchase. BMW Certified, GREAT MILES 34,073! NAV, Sunroof, Heated Seats, Dual Zone A/C, CD Player, All Wheel Drive, Turbo, LIGHTING PACKAGE, HEATED FRONT SEATS, ULTIMATE PACKAGE, M SPORT LINE. KEY FEATURES INCLUDE Turbocharged, CD Player, Dual Zone A/C Rear Spoiler, All Wheel Drive, Onboard Communications System, Child Safety Locks, Steering Wheel Controls. OPTION PACKAGES ULTIMATE PACKAGE Rear View Camera, Remote Services, Universal Garage-Door Opener, BMW Online & BMW Apps, Park Distance Control, Satellite Radio , Lumbar Support, Comfort Access Keyless Entry, Voice-Command, Auto-Dimming Interior & Exterior Mirrors, Auto-Dimming Rearview Mirror, Navigation System, BMW Apps, Enhanced USB & Bluetooth w/Smartphone Integration, Power Front Seats w/Driver Seat Memory, Real Time Traffic Information, Panoramic Moonroof, Interior Mirror w/Compass, Ambiance Lighting, M SPORT LINE Increased Top Speed Limiter, Shadowline Exterior Trim, Performance Control, Sport Suspension, High-Gloss Roof Rails, Anthracite Headliner, M Sports Leather Steering Wheel w/Paddle Shifters, M Sport Package MORE ABOUT US Welcome to Reeves Import Motorcars, a family owned and operated business since 1971. On behalf of our staff, thank you for visiting us on the Web and giving us an opportunity to acquaint you with our dealership. Our commitment to perfection is exceeded only by our resolve to offer you the highest levels of guest services in the luxury automotive industry. Our professional and well trained staff is ready to assist you with your new or pre-owned automotive needs. While every reasonable effort is made to ensure the accuracy of this information, we are not responsible for any errors or omissions contained on these pages. All offers are mutually exclusive. All vehicles subject to prior sale. Please verify any informa Horsepower calculations based on trim engine configuration. Please confirm the accuracy of the included equipment by calling us prior to purchase. BMW Certified. Heated Seats, Nav System, Moonroof, Panoramic Roof, Power Liftgate, CD Player, Dual Zone A/C, Rear Air, iPod/MP3 Input, All Wheel Drive, DRIVER ASSISTANCE PLUS, DRIVER ASSISTANCE PACKAGE, COLD WEATHER PACKAGE, PREMIUM PACKAGE, Turbo Charged Engine, Aluminum Wheels, TECHNOLOGY PACKAGE. KEY FEATURES INCLUDE Panoramic Roof, Power Liftgate, Rear Air, Turbocharged, iPod/MP3 Input, CD Player, Dual Zone A/C. Rear Spoiler, Sunroof, All Wheel Drive, Onboard Communications System, Aluminum Wheels. OPTION PACKAGES TECHNOLOGY PACKAGE Head-Up Display, Navigation System, Remote Services, Advanced Real-Time Traffic Information, BMW Online & BMW Apps, Instrument Cluster w/Extended Contents, DRIVER ASSISTANCE PLUS Speed Limit Information, Active Driving Assistant, lane departure warning, forward collision warning, pedestrian warning and city collision mitigation, Active Blind Spot Detection, Side & Top View Cameras, COLD WEATHER PACKAGE Heated Front Seats, Heated Rear Seats, Heated Steering Wheel, Retractable Headlight Washers, PREMIUM PACKAGE Satellite Radio, Comfort Access Keyless Entry MORE ABOUT US Welcome to Reeves Import Motorcars, a family owned and operated business since 1971. On behalf of our staff, thank you for visiting us on the Web and giving us an opportunity to acquaint you with our dealership. Our commitment to perfection is exceeded only by our resolve to offer you the highest levels of guest services in the luxury automotive industry. Our professional and well trained staff is ready to assist you with your new or pre-owned automotive needs. While every reasonable effort is made to ensure the accuracy of this information, we are not responsible for any errors or omissions contained on these pages. All offers are mutually exclusive. All vehicles subject to prior sale. Please verify any informa Horsepower calculations based on trim engine configuration. Please confirm the accuracy of the included equipment by calling us prior to purchase. BMW Certified, ONLY 32,130 Miles! NAV, Sunroof, Rear Air, iPod/MP3 Input, Dual Zone A/C, Keyless Start, CD Player, NAVIGATION SYSTEM, MOONROOF, DRIVER ASSISTANCE PACKAGE, Turbo, M SPORT PACKAGE. KEY FEATURES INCLUDE Rear Air, Turbocharged, iPod/MP3 Input, CD Player, Keyless Start, Dual Zone A/C. Onboard Communications System, Keyless Entry, Child Safety Locks, Steering Wheel Controls, Heated Mirrors. OPTION PACKAGES M SPORT PACKAGE M footrest (not w/beige upholsteries) and signature key, Alum Hexagon Trim w/Estoril Blue Matte Highlight, Shadowline Exterior Trim, Aerodynamic Kit, M Sport Suspension, Wheels: 18 x 8.0 Fr & 18 x 8.5 Rr (Style 400M) Star-spoke, Tires: P225/45R18 Fr & P255/40R18 Rr Mixed Summer, Increased Top Speed Limiter, M Steering Wheel, M Sport Package (337), NAVIGATION SYSTEM Remote Services, Advanced Real-Time Traffic Information, BMW Online & BMW Apps, Instrument Cluster w/Extended Contents, MOONROOF, DRIVER ASSISTANCE PACKAGE Rear View Camera, Park Distance Control. Unlimited Miles for 1-Year plus the balance of original new vehicle warranty (4-Year/50,000-Miles) BUY FROM AN AWARD WINNING DEALER Welcome to Reeves Import Motorcars, a family owned and operated business since 1971. On behalf of our staff, thank you for visiting us on the Web and giving us an opportunity to acquaint you with our dealership. Our commitment to perfection is exceeded only by our resolve to offer you the highest levels of guest services in the luxury automotive industry. Our professional and well trained staff is ready to assist you with your new or pre-owned automotive needs. While every reasonable effort is made to ensure the accuracy of this information, we are not responsible for any errors or omissions contained on these pages. All offers are mutually exclusive. All vehicles subject to prior sale. Please verify any informa Horsepower calculations based on trim engine configuration. Please confirm the accuracy of the included equipment by calling us prior to purchase. BMW Certified, GREAT MILES 33,374! Sunroof, iPod/MP3 Input, CD Player, Dual Zone A/C, Keyless Start, Rear Air, M SPORT PACKAGE, DRIVER ASSISTANCE PACKAGE, Power Liftgate, Turbo Charged. KEY FEATURES INCLUDE Power Liftgate, Rear Air, Turbocharged, iPod/MP3 Input, CD Player, Keyless Start, Dual Zone A/C. MP3 Player, Sunroof, Onboard Communications System, Remote Trunk Release, Keyless Entry. OPTION PACKAGES M SPORT PACKAGE Alum Hexagon Trim w/Estoril Blue Matte Highlight, Shadowline Exterior Trim, Aerodynamic Kit, M Sport Suspension, Wheels: 18 x 8.0 Fr & 18 x 8.5 Rr (Style 400M) Star-spoke, Tires: P225/45R18 Fr & P255/40R18 Rr Mixed Summer, Increased Top Speed Limit, M Steering Wheel, M Sport Pkg, DRIVER ASSISTANCE PACKAGE Rear View Camera, Park Distance Control. PURCHASE WITH CONFIDENCE Unlimited Miles for 1-Year plus the balance of original new vehicle warranty (4-Year/50,000-Miles), 24-Hour BMW Roadside Assistance, Comprehensive Inspection and Reconditioning, Trip-Interruption Services, Trip-Planning Services EXCELLENT SAFETY FOR YOUR FAMILY Child Safety Locks MORE ABOUT US Welcome to Reeves Import Motorcars, a family owned and operated business since 1971. On behalf of our staff, thank you for visiting us on the Web and giving us an opportunity to acquaint you with our dealership. Our commitment to perfection is exceeded only by our resolve to offer you the highest levels of guest services in the luxury automotive industry. Our professional and well trained staff is ready to assist you with your new or pre-owned automotive needs. While every reasonable effort is made to ensure the accuracy of this information, we are not responsible for any errors or omissions contained on these pages. All offers are mutually exclusive. All vehicles subject to prior sale. Please verify any informa Horsepower calculations based on trim engine configuration. Please confirm the accuracy of the included equipment by calling us prior to purchase. BMW Certified, ONLY 21,705 Miles! Sunroof, Navigation, CD Player, Turbo Charged, Dual Zone A/C, iPod/MP3 Input, DRIVER ASSISTANCE PACKAGE, WHEELS: 18 X 7.5 FR & 18 X 8.0 RR (ST... TECHNOLOGY PACKAGE, PREMIUM PACKAGE. KEY FEATURES INCLUDE Turbocharged, iPod/MP3 Input, CD Player, Dual Zone A/C Onboard Communications System, Steering Wheel Controls, Heated Mirrors, Electronic Stability Control, Bucket Seats. OPTION PACKAGES PREMIUM PACKAGE Auto-Dimming Rearview Mirror, Universal Garage-Door Opener, Auto-Dimming Interior & Exterior Mirrors, Moonroof, Power Front Seats, Satellite Radio, Ambient Lighting, Comfort Access Keyless Entry, Lumbar Support, TECHNOLOGY PACKAGE Remote Services, Advanced Real-Time Traffic Information, BMW Online & BMW Apps, Navigation System, Instrument Cluster w/Extended Contents, DRIVER ASSISTANCE PACKAGE Rear View Camera, Park Distance Control, WHEELS: 18 X 7.5 FR & 18 X 8.0 RR (STYLE 384) Light alloy, double-spoke, Tires: P225/40R18 Fr & P245/35R18 Rr Mixed performance Run-flat, Increased Top Speed Limiter. MORE ABOUT US Welcome to Reeves Import Motorcars, a family owned and operated business since 1971. On behalf of our staff, thank you for visiting us on the Web and giving us an opportunity to acquaint you with our dealership. Our commitment to perfection is exceeded only by our resolve to offer you the highest levels of guest services in the luxury automotive industry. Our professional and well trained staff is ready to assist you with your new or pre-owned automotive needs. While every reasonable effort is made to ensure the accuracy of this information, we are not responsible for any errors or omissions contained on these pages. All offers are mutually exclusive. All vehicles subject to prior sale. Please verify any informa Horsepower calculations based on trim engine configuration. Please confirm the accuracy of the included equipment by calling us prior to purchase. BMW Certified, ONLY 36,279 Miles! Nav System, Heated Seats, Moonroof, iPod/MP3 Input, Turbo Charged Engine, Dual Zone A/C, Rear Air, DRIVER ASSISTANCE PACKAGE, harman/kardon SURROUND SOUND SYSTEM, HEATED FRONT SEATS, TECHNOLOGY PACKAGE, PREMIUM PACKAGE, M SPORT PACKAGE. KEY FEATURES INCLUDE Rear Air, Turbocharged, iPod/MP3 Input, Dual Zone A/C. Onboard Communications System, Child Safety Locks, Steering Wheel Controls, Electronic Stability Control, Heated Mirrors. OPTION PACKAGES M SPORT PACKAGE M footrest (not w/beige upholsteries) and signature key, Alum Hexagon Trim w/Estoril Blue Matte Highlight, Shadowline Exterior Trim, Aerodynamic Kit, M Sport Suspension, Wheels: 18 x 8.0 Fr & 18 x 8.5 Rr (Style 400M) Star-spoke, Tires: P225/45R18 Fr & P255/40R18 Rr Mixed Summer, Increased Top Speed Limiter, M Steering Wheel, M Sport Package (337), TECHNOLOGY PACKAGE Head-Up Display, Navigation System, Remote Services, Advanced Real-Time Traffic Information, BMW Online & BMW Apps, Instrument Cluster w/Extended Contents, PREMIUM PACKAGE LED Headlights, Moonroof, Satellite Radio VISIT US TODAY Welcome to Reeves Import Motorcars, a family owned and operated business since 1971. On behalf of our staff, thank you for visiting us on the Web and giving us an opportunity to acquaint you with our dealership. Our commitment to perfection is exceeded only by our resolve to offer you the highest levels of guest services in the luxury automotive industry. Our professional and well trained staff is ready to assist you with your new or pre-owned automotive needs. While every reasonable effort is made to ensure the accuracy of this information, we are not responsible for any errors or omissions contained on these pages. All offers are mutually exclusive. All vehicles subject to prior sale. Please verify any informa Horsepower calculations based on trim engine configuration. Please confirm the accuracy of the included equipment by calling us prior to purchase. BMW Certified, ONLY 31,159 Miles! Nav System, Moonroof, Heated Seats, Turbo Charged Engine, Dual Zone A/C, iPod/MP3 Input, CD Player, Power Liftgate, All Wheel Drive, Aluminum Wheels, NAVIGATION BUSINESS, RUNFLAT TIRES, TRANSMISSION: 8-SPEED STEPTRONIC AUTO... COLD WEATHER PACKAGE, PREMIUM PACKAGE, DRIVER ASSISTANCE PLUS, DRIVER ASSISTANCE PACKAGE. KEY FEATURES INCLUDE Power Liftgate, Turbocharged, iPod/MP3 Input, CD Player, Dual Zone A/C. Rear Spoiler, MP3 Player, All Wheel Drive, Onboard Communications System, Aluminum Wheels. OPTION PACKAGES PREMIUM PACKAGE Universal Garage-Door Opener, Auto-Dimming Interior & Driver Exterior Mirrors, Auto-Dimming Rearview Mirror, LED Headlights w/Cornering Lights, Power-Folding Mirrors, Panoramic Moonroof, Satellite Radio , Ambiance Lighting, Comfort Access Keyless Entry, Lumbar Support, NAVIGATION BUSINESS Remote Services, Advanced Real-Time Traffic Information, BMW Connected App Compatibility, BMW Online & BMW Apps, DRIVER ASSISTANCE PACKAGE Rear View Camera, Park Distance Control, Parking Assistant, DRIVER ASSISTANCE PLUS Active Driving Assistant WHY BUY FROM US Welcome to Reeves Import Motorcars, a family owned and operated business since 1971. On behalf of our staff, thank you for visiting us on the Web and giving us an opportunity to acquaint you with our dealership. Our commitment to perfection is exceeded only by our resolve to offer you the highest levels of guest services in the luxury automotive industry. Our professional and well trained staff is ready to assist you with your new or pre-owned automotive needs. While every reasonable effort is made to ensure the accuracy of this information, we are not responsible for any errors or omissions contained on these pages. All offers are mutually exclusive. All vehicles subject to prior sale. Please verify any informa Horsepower calculations based on trim engine configuration. Please confirm the accuracy of the included equipment by calling us prior to purchase. BMW Certified, ONLY 32,598 Miles! Nav System, Heated Seats, Moonroof, Dual Zone A/C, iPod/MP3 Input, Chrome Wheels, Rear Air, Turbo Charged Engine, harman/kardon SURROUND SOUND SYSTEM, HEATED FRONT SEATS, TRANSMISSION: SPORT AUTOMATIC W/SHIFT... DRIVER ASSISTANCE PACKAGE, TECHNOLOGY PACKAGE, PREMIUM PACKAGE, M SPORT. KEY FEATURES INCLUDE Rear Air, Turbocharged, iPod/MP3 Input, Dual Zone A/C. Sunroof, Onboard Communications System, Chrome Wheels, Steering Wheel Controls, Heated Mirrors. OPTION PACKAGES M SPORT chrome rings around A/C and radio controls, M footrest (not w/beige upholsteries), sport instrument cluster and signature key, Aluminum Hexagon Interior Trim, Increased Top Speed Limit, Shadowline Exterior Trim, Anthracite Headliner, Delete Sport Leather Steering Wheel, M Sport Pkg, Estoril Blue Matte Highlight Trim Finishers, Delete Front Fog Lights, Without Lines Designation Outside, Aerodynamic Kit, Sport Seats, M Sport Suspension, Wheels: 18 x 8 Fr & 18 x 8.5 Rr (Style 400M) Star-spoke, Tires: P225/45R18 Fr & P255/40R18 Rr Mixed Summer, M Steering Wheel WHO WE ARE Welcome to Reeves Import Motorcars, a family owned and operated business since 1971. On behalf of our staff, thank you for visiting us on the Web and giving us an opportunity to acquaint you with our dealership. Our commitment to perfection is exceeded only by our resolve to offer you the highest levels of guest services in the luxury automotive industry. Our professional and well trained staff is ready to assist you with your new or pre-owned automotive needs. While every reasonable effort is made to ensure the accuracy of this information, we are not responsible for any errors or omissions contained on these pages. All offers are mutually exclusive. All vehicles subject to prior sale. Please verify any informa Horsepower calculations based on trim engine configuration. Please confirm the accuracy of the included equipment by calling us prior to purchase.